Collaboration is an important part of your team's workflow. Sympli allows you to share your projects with your teammates to help you achieve this goal. When you share a project with a teammate, he/she will join it with the User role by default. But... what can a User do? Viewer: This role allows a collaborator to only browse designs. Reviewer: A reviewer can browse designs and add comments to them. 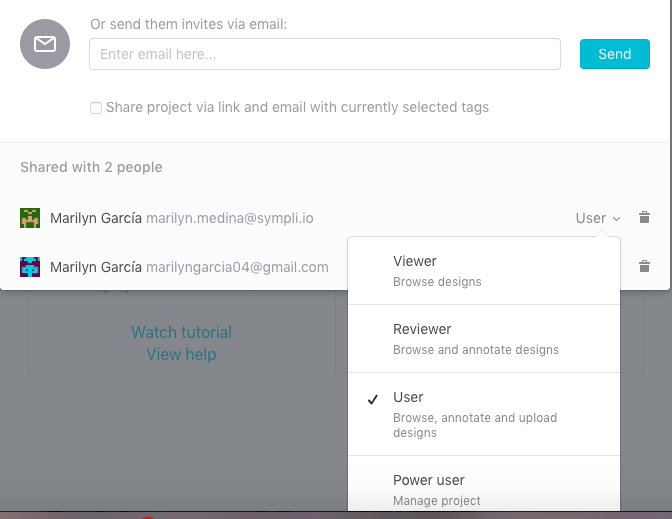 User: A user will be able to upload designs to a project besides the viewer and reviewer capabilities. Power user: Granting a collaborator the power user role means that he/she will be able to manage project settings, upload/delete designs in the project, add/delete collaborators and modify other users' roles. To change a collaborator's role for a project, the Project Owner or a Power User needs to click on the Share Project button in the top right corner of the project's page and select the new role from the dropdown menu that appears next to each collaborator's name in the Share with tab.